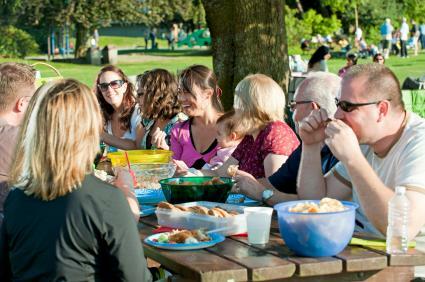 Family reunions offer a great way to reconnect with relatives, especially ones that you don't see on a regular basis. The key to holding a successful reunion is getting the word out with attractive invitations that provide all the essential information. You can spend a fortune at the print shop, or you can download either of these free invitations and print them yourself. The invitations you see here can easily be customized with your own information. If you need help downloading the invitations, check out these helpful tips. This invitation design works great for a less formal family reunion. Consider using it for a reunion picnic, barbecue, or luncheon. 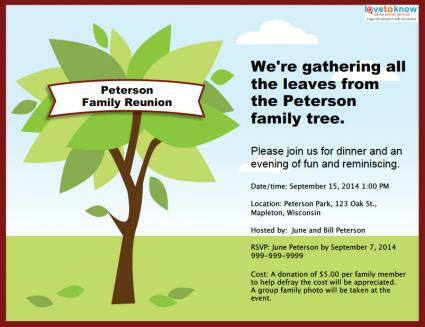 The family tree design on this example instantly lets everyone know what this invitation is about before they even read the rest of the information. 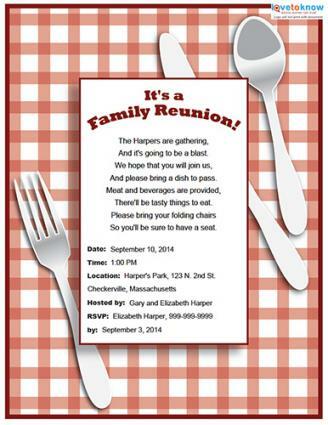 The more general design of this invitation makes it suitable for a wider variety reunion gatherings and activities. To save yourself some time and resources, take a few minutes to carefully proofread your invitation before you print. Print just one copy, and then take another close look to make sure your invitation doesn't need any other changes. If it looks correct, you're ready to print out as many copies as you need for your entire family.